Our team is passionate about dental care. 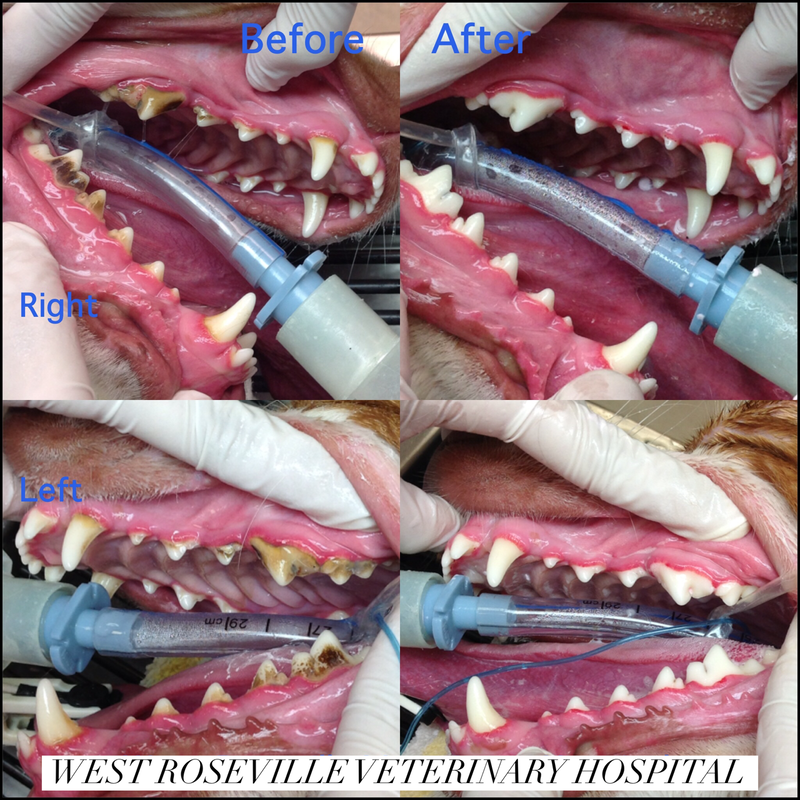 Preventative care and understanding that about 75% of disease occurs under the gum line where we can’t see it are two critical factors when it comes to Dental care for your pet. Dental x rays, why? Are they necessary for every patient? YES YES YES! Our pets do not tell us they are in pain. Every patient that has a complete oral health assessment has x-rays done while under general anesthesia. It is common to do an oral exam in an animal that there was no complaint of a problem and find broken teeth or roots. Dog's often suffer broken roots from chewing hard objects yet continue to chew on them despite the pain. Together as your veterinarian, we will go over the importance of home dental care and what you can do at home once the dental prophylaxis is completed. Our goal is to improve your pet’s overall health and longevity. Properly cleaning the teeth with an ultrasonic scaler and by hand above and below the gum line, then polishing to leave the tooth surface smooth to inhibit plaque accumulation. Damaged or abscessed teeth need to be removed. In some cases root canals can be done to save the teeth and we can refer you to a veterinary dentist if you prefer this option. (A rough estimate for a root canal and crown is $2000 per tooth, this can vary). The extent of root disease can’t be determined just from observation of the crowns so the final decision about this will come after evaluation of the x rays. This is why dental estimates can only be a rough estimate of the work needed. We try our best to give you perspective on how bad your pet’s dental disease is, but there is always the probability that we will have to call you during anesthesia to discuss what we found on exam and x ray and adjust the estimate accordingly. Below are some common reasons for extraction. ​1. Chronic infection, often due to tooth crowding, that allows bacteria to break down the tissue that attaches tooth to bone. This is a really common issue in dogs under 20 pounds and all short-faced breeds. 2. Root or crown fractures. When a tooth is damaged, it can allow bacteria to move into the root canal and down to the tip of the root. Not all fractures expose the root canal and x rays are how we can tell the difference. This type of damage is commonly caused by trauma such as chewing on hard objects. Anything you can’t push your thumb into can break teeth. ​4. FORL’s in cats. This is an autoimmune disease in which cats digest their own enamel leaving holes in the teeth that exposes the nerve and causes a lot of pain. These teeth always need to be removed and this is a condition that often affects more teeth over time. These cats should have their teeth checked every 6-12 months. What can my pet eat after extractions? Any food they are used to! Pet food does not require chewing to make the nutrients digestible. For the first 10-14 days after surgery we will recommend a soft diet while the extraction sites heal. This can be canned food, or the dry food they are used to soaked in warm water for 30 minutes. A very important point here, is, all teeth can be removed and your pet still has an excellent quality of life. In some cases, the tissue below the gum line is diseased and needs to be scraped out and packed with antibiotic gel (doxyrobe). 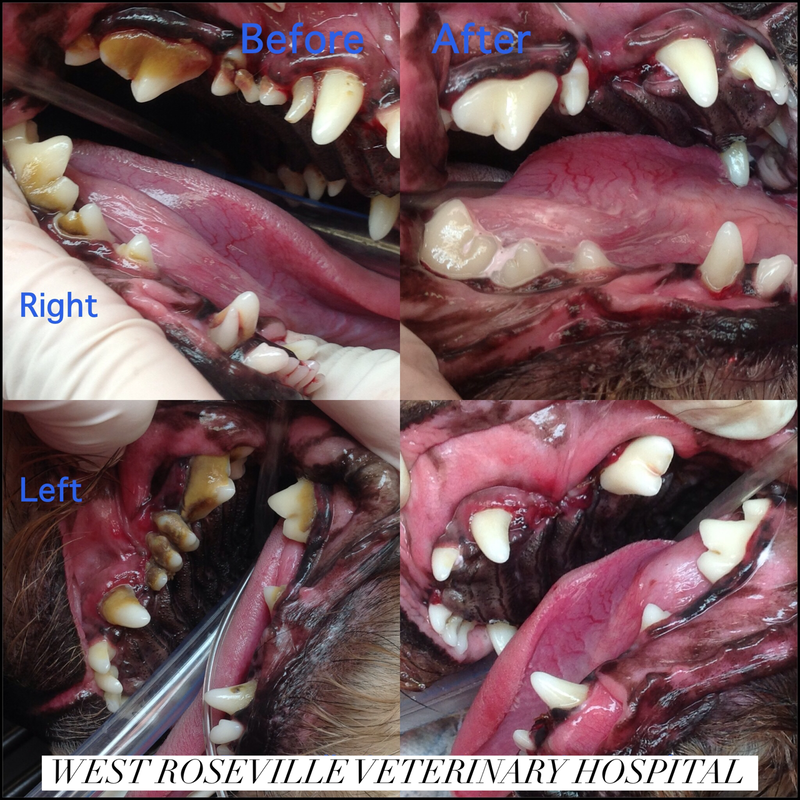 This is done to extend the life of teeth that otherwise would become abscessed without treatment. Not all teeth can be saved but we do try to save the ones that look hopeful. Home care is critical; a properly done dental cleaning with polishing will keep your pet’s teeth clean for about 3 months if you do nothing at home. So why have it done at all? Once calculus is bonded to the teeth (this takes 48-72 hours) it cannot be brushed off. So when hardened calculus is identified during your pet’s health exam a professional cleaning is needed. What can you do at home to help your pet keep their teeth healthy for life? There are actually a lot of options and some combination of the following with help keep your pet’s teeth healthy for years to come. ​1. Brushing-this is by far the most useful dental health tool because it physically removes food debris and plaque from the teeth and gums. The success of brushing depends on your pet’s cooperation, which is an issue of training/desensitizing, which can take time in older pets, as well as technique and frequency. Brushing should be done daily to be most effective, after 2 days, some tartar will be hardened already. 3. Dental chews and treats are great to help with the areas missed by brushing. Two good examples are Orovet chews and Hextra chews.